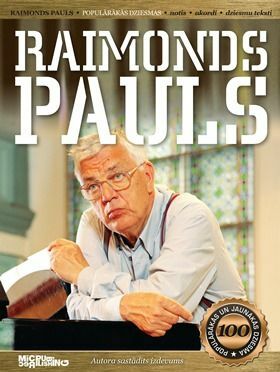 Raimonds Pauls and MicRec Publishing in the anticipation of the composer's 78th birthday this past Sunday on the Maestro birthday launched the composer's 100 most popular and newest sheet music song book and CD with the 20 most popular songs phonograms. The book contains the same composer of songs selected from "golden" repertoire of the poet Alfrēds Krūklis, Imants Ziedonis, Jānis Peters, Vizma Belševica, Austra Skujiņa, Leons Briedis and other poets of the lyrics, as well as the very latest songs from the theater performances „Sudraba slidas”, ”Marlēna”, „Trubadūrs uz ēzeļa” and „Leo. Pēdējā bohēma”. Sheet music book is available both individually and in a special package, which also includes a CD with 20 songs popular Maestro instrumental accompaniments. This kit will be particularly useful for school vocal ensembles, children's ensembles, vocalists, and anyone who needs this instrumental version of the accompaniment. This CD includes both the so-called "karaoke" version, as well as several well-known performer recorded on the original instrumental phonograms, among which the song accompaniment as „Mēmā dziesma”, „Viss nāk un aiziet tālumā”, „Kūko, kūko dzeguzīte”, „Cāļus skaita rudenī”. Supporters of the book: UNA magazine, TVNET internet portal, Latvian Radio 2 and TV 3. You can buy the book and CD bundle for a special price for a month from January 17th till February 17th at the ‘’Spice’’ shopping mall.